Duality Scaramouche bracelet by Gas Bijoux. Polished 24-karat yellow gold plated brass. Hand plated multihued enamel beetle ends. 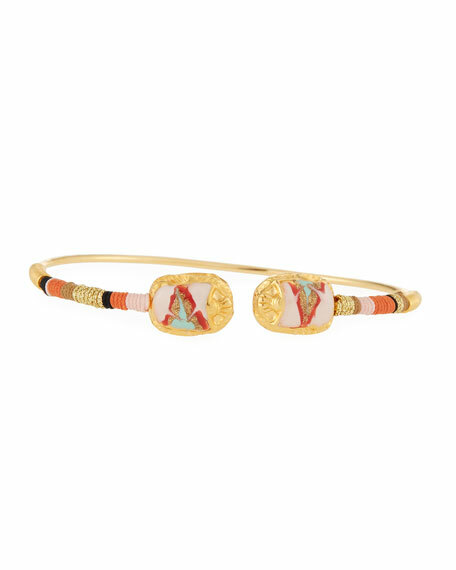 Alexis Bittar skinny hinged bangle bracelet. 10-karat yellow gold-plated hardware. Hand-sculpted, hand-painted Lucite®. Golden clasp with crystal pavé. Approx. 2.5"
Alexis Bittar skinny hinged bangle bracelet. 10-karat yellow gold-plated hardware. Hand-sculpted, hand-painted Lucite®. Golden clasp with crystal pavé. Approx. 2.5" diameter; 0.3"H. Hinged opening eases dress. Made in USA. Large dome hinge bracelet by Alexis Bittar. Polished 10-karat yellow gold plated brass. Signature sculpted and painted Lucite®. Wide Lucite® frame with crystal pavé. Approx. 2.4" diameter; 2.1"W. Hinged opening eases dress. Made in USA.